Mmmm. There’s nothing quite like it! Warm and melty, salty with a touch of sweet – butter accentuates and completes the flavor of some of our favorite foods. Its smooth oily-ness not only adds moisture to our crumbly baked goods, but it’s also a very useful slippery coating for our baking pans. 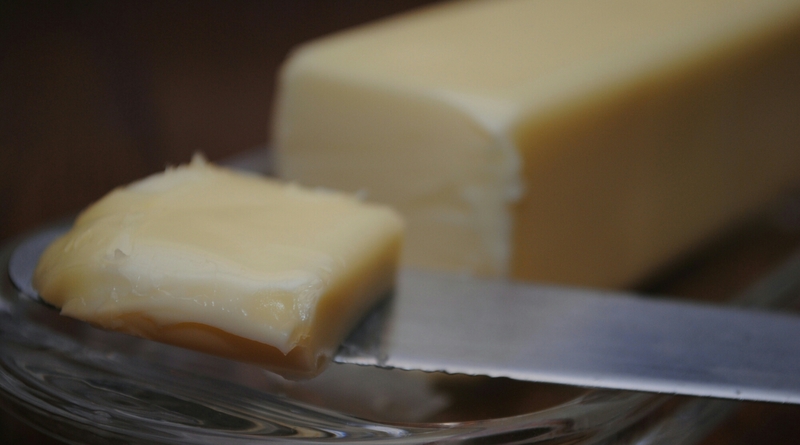 Although I’m a huge fan of buttering my food, “buttering up” has never really been my thing. Spreading on some slick compliments and calorie-filled praise may have helped me get my way or at least win someone’s favor, but I’ve never been one to indulge. I may have remained on my parents’, teachers’, and bosses’ good sides, but it wasn’t the result of flattery. Even today, I’m not one to hand out compliments where I don’t believe they are fully deserved and my intentions aren’t 100% pure. A couple months ago, I picked up “Fervent: A Woman’s Battle Plan for Serious, Specific, and Strategic Prayer” by Priscilla Shirer. I knew my prayer life was dry and needed some flavor, and this book seemed perfect. As I began reading, I wasn’t surprised to be introduced to yet another prayer “acronym”. And since I’ve been using the “ACTS”* prayer pattern for many years, I wasn’t surprised to see this one – “PRAY”** – also begin with “praising” God. As soon as I read this, though, I immediately felt discouraged. Because it’s not really my thing. Believe me, I’ve tried, but I just can’t escape the fact that it feels fake. Whenever I try to put together some words of adoration towards God, it feels awkward and contrived – like I’m just trying to impress Him with some big-worded compliments or “get on His good side”. It feels like I’m trying to butter Him up. And since I’m not really into that, many times I’ve thought it makes more sense just to skip it. If my heart’s not 100% there and I’m not naturally, in that moment, overflowing with praise for God, then why should I even bother? I would never want Him to think I was just making up something that sounds good. I would never want Him to think I was just doing it to get what I want. It occurred to me as I read this that maybe the reason for the dryness in my prayers was the result of a lack of butter. Not because God needed buttering up, but because I needed it. It turns out that deliberate, intentional praise is actually the substance that prepares and smooths the surface of our hearts as we pray. Because any way that we can lift Him up reminds us of who we are in comparison. Any way we can recount what He has already done assures us of how much we can trust Him before we even ask. Any way we can make it about Him prepares us for a conversation – where it’s not just about what we want to say to God, but what He might want to say to us. And any words we can find to describe His character give us a taste of His rich and delightful goodness toward us as His children. It turns out that praise is the butter of prayer – just not in the way I originally thought. Even if the best words we can come up with sound cheesy or repetitive or simple and even if our (very human and very volatile) human hearts aren’t 100% all-in, praising God not only brings Him glory, but it changes us in the process. And honestly, life is just better when I begin and end my day by soaking my heart with a large pat of praise. So beginning that day, I decided to make praising God a non-optional part of my prayers. And since, believe it or not, I struggle to come up with the words, I’ve decided to start by borrowing someone else’s. The Psalms are full of words of praise, so each morning I find a verse or two to copy down into my prayer journal as I begin to pray. Each day, my mind is being coated with thoughts of Him and my heart is being softened by who He is. I know now that it really is good to praise our God. I’ve said a lot of things I regret. In the thirty-something years I’ve been using this mouth it’s caused me quite a bit of trouble! A lot of times it’s just silly stuff – like getting someone’s name wrong or trying to be funny or ‘cool’ and failing miserably. As a very ‘open’ person, I’m a professional at making people uncomfortable by sharing too much information or telling long stories that really have nothing to do with anything. Also, I hate silence, so I’m always looking for ways to fill those gaps in conversation – but since I’m not a quick-thinker, I tend to make an awkward moment even more awkward. But the times I regret most are the times the sinful condition of my heart has leaked out of my lips – because unfortunately, “the mouth speaks what the heart is full of” (Luke 6:45). Since I’m human, there’s a lot of pride, judgement, defensiveness and fear hanging out in there – and when I empty that stuff out on the people around me, I’m left with a heart full of shame and regret. Because there’s no “undo” button. We’ve grown spoiled in our technological age – our mistakes can often be completely and immediately fixed with the touch of a button, and no one ever has to know! We can backspace, edit, revert, and get a re-do on almost anything. As my older two girls have started being assigned more computer-based projects, I’ve loved teaching them that “Ctrl + Z is your best friend!” This stress-saving feature has revolutionized our world because we are free to make mistakes when we know we can always “undo” them. Unfortunately, sometimes what we think is sparing us stress may actually be causing it! In a world where we can always “undo”, we have mastered the art of perfecting our presentation. When we color outside the lines – instead of having to let it show and let it go, we can just tap a button, rewind, and try again. And when we’re constantly exposed to the perfected images of those around us, we leave ourselves vulnerable to feelings of shame whenever we seem to be falling short. We’ve all felt the society and culture-based shame that comes from not measuring up to the standards we are (or think we are) being judged by. The desire to be accepted and fit in with a crowd (yes, even for us ‘grown-ups’) is real and sometimes the things that come out of our mouths in an attempt to belong or impress surprise us! Like me, you’ve probably said a few things over the years that made you look a little foolish or feel embarrassed – they may have even left you feeling that you’ve accomplished the opposite of your goal! But the greater shame, like I said before, comes from the times I “bite” on the temptation to spill out those juicy tidbits of gossip, share that critical ‘observation’ I made on someone’s behavior, ‘vent’ my frustration when things (a.k.a. people) don’t go the way (a.k.a. do what) I thought they should, or when I vomit my emotional state to my family making sure they know exactly how they are at fault for it. It’s in those moments a part of me wants to run and hide – or at least never open my mouth again. In Genesis 3, we are first introduced to the concept of shame. Adam and Eve had literally taken a bite of sin – they gave in to the temptation and chose to satisfy a desire their own way instead of God’s. And immediately, instead of feeling fulfilled, they felt naked and exposed. As a sinner myself, I feel Adam and Eve’s pain – that deep-in-the-pit-of-their-stomachs regret and desperate desire to turn back time and undo what they had done. The pangs of fear that their exposure would be their undoing and that they would not only disappoint God, but be rejected by Him. So they “made coverings for themselves” and then they hid, hoping to avoid the even greater shame that would come from being in God’s holy presence. God created a lot of things, but shame wasn’t one of them. It was introduced by the evil one and then reinforced by the deceitful condition of the human heart – twisting the conviction of sin (“You made a bad choice”) to a questioning of His character (“You are a bad choice”). It was not ever God’s intention that we would feel the need to escape from His presence – it was never His intention that we would hide because of the fear of being rejected by Him. And though their sin couldn’t be undone, their shame could. Verse 21 says, “The LORD God made garments of skin for Adam and his wife and clothed them.” They had tried to cover it up on their own – even to the point of refusing to take the blame when they had been caught. But instead of furthering their shame, God Himself made a sacrifice in order to take it away. But sometimes I’m actually glad – because it worked out better in the end that I couldn’t go back. Not being able to fix something the way I wanted to fix it meant I learned something new or had to (gulp) ask for help – and that person ended up making my project better than I ever could have made it. It’s the same with my sin. Of course I would love to go back in time (to so many times) and, knowing what I know now, tape my big mouth shut! But, in the end, every time I fall short it gives me that push I need to run straight to the presence of God – to a place where I can be overwhelmed by His glory, confess my sin and then be reminded of His great love for me. And I wouldn’t trade that for anything! As church youth leaders, Tim and I get invited to our fair share of weddings. Especially now that we’ve been doing high school ministry for almost ten years – the invitations are rolling in. And although anything involving the word “formal” is not our forte, we feel very honored and blessed to be able to celebrate these special days with our former students and interns! When our most recent intern, Jake, invited us to his wedding in northern Vermont, we were thrilled because the timing was perfect. We were already going to be in Vermont anyway, and the idea of leaving the kids with Nana and Grandpa and turning it into a weekend away for the two of us sounded great! Since the wedding was on Saturday afternoon at 2:00, we took the opportunity to sleep in (woo-hoo! ), go out to breakfast, and then visit some local friends for lunch. We got ourselves fancied up for the event, and, in typically Tim and Mandy style – left with just barely enough time to get there. Yep, we were not just a minute late. We were three hours late. We totally missed the wedding. Ouch. You may be wondering: How did this happen? Why in the world did we think the wedding was at 2:00 anyway? The answer is: we have no idea. Tim says I told him it was at 2:00, and I think he told me it was at 2:00. Regardless, we both had every opportunity to double-check the time. Tim was even on Jake and Mackenzie’s (super-cool and very informative – why didn’t they have this when we were getting married?!) wedding website looking up directions the day before! Truthfully, though, the majority of the blame falls on me. You see, I recently discovered this amazing, revolutionary, life-altering feature on my phone. If you’re an iPhone person this may be hard for you to understand, but Android phones have these awesome things called “widgets”. And the Google Calendar app now has a “widget” that allows me to display my calendar on the home screen of my phone – no buttons to push, no days to select – my schedule for that day is right there every time I turn my screen on. As the day goes on, the events scroll through and I can see what’s coming next – so I’ll never miss anything! As long as I actually look at it. I can’t even tell you how many times that day (or any of the previous days, as this was the ONLY event on my calendar that week) I had been on my phone – reading a text, writing a message, or checking social media. And in all those times, I never actually looked at the calendar – because “Jake and Mackenzie’s Wedding, 11AM” was right there. Two years ago this January, I set out to read through the entire Bible, and I officially accomplished that goal as of December 31st of last year. I learned so much and gained an incredible “big picture” perspective during that time! But for the next few years, I’ve decided to slow things down, go through it all again, and find all the little stuff I might have missed. In my first few days in Genesis so far, I’ve already been shocked and brought to my knees several times by things I never noticed before or have come to see in a new way. In every segment of a few verses, there has been something that applied directly to my life or that has given me a deeper understanding of who God is and who I am in light of that. The temptation, though, when I read passages like this that are SO familiar (I’ve read, studied, heard sermons about, and even taught on these verses dozens of times! ), is to just skim over them or skip whole sections entirely because “I already know all of this”. But like my smartphone calendar, we make dangerous assumptions when we think we’ve seen or heard it all before – and then don’t take the time to really look at it. Reading the Bible is not a ‘hit or miss’ activity. I don’t have to open it up just hoping that maybe God will speak to me through His words that day. Hebrews 4:12 says that, “the word of God is alive and active” and I can be assured that He always has plans to bring about growth and change in my life through it. There is something He wants me to see every single time I open it up – the question is: Am I also opening up my heart and my eyes to actually look for it? The two-hour car ride home from the wedding last Saturday was a long one. We were frustrated, irritable and just flat-out disappointed. It wasn’t like anyone was depending on us being there – we only really knew one other person. And when we congratulated (and apologized to) Jake, he was very gracious and understanding. But the thing was that we just missed out! We missed out on the experience of being there to see two really amazing people get married. We missed out on celebrating this important day with them! The truth is that God is God and if He wants to speak something into your life, He will absolutely find a way – whether you’re looking for it or not. But every time you read or hear a passage from God’s word you are facing a potentially life-altering experience – who knows that God did not place that exact verse in your path “for such a time as this”? Who knows but that the answer to your stress, your worry, or your burden that day might be right in front of you? “I’m dreaming of a white…” Oh wait, I guess it’s too late for that! But winter isn’t over yet – and as long as we don’t get more than three snow days (we want our spring break! ), let it snow, let it snow, let it snow! There’s something about snow that fascinates us. For some it’s a sentimental excitement stemming from childhood memories. For many it’s the relief of a day off of work or school. And for most it’s just the unmatched peace and beauty of that glistening, soft, pure white blanket covering the world around us. Last week we had the opportunity to be in Vermont for one of their first snows of the season. It was awesome! No matter how much I dislike the cold, I love a good snowstorm. But I was reminded, as I am every year, that the beauty is short-lived. A couple of passes by the plows spreading sand and salt and that wonderful white perfection is now an ugly half-melted mess of dirt and ice. Even the snow that wasn’t anywhere near the street seems to be quickly littered with little specks of debris. It’s the story of humanity that runs from the first pages of Scripture all the way to us in 2016 – moments of glory, quickly followed by moments of failure. Great acts of obedience soon plowed off to the side by the temptations of the flesh. Hearts of pure trust tainted by the debris of doubt and self-interest. The story of King David might be one of the most poignant. As a young man, David was chosen by God to be the next king of His people. And though the road to taking the throne was not necessarily pretty, David continued on in obedience. This obedience resulted in great blessing and David was so successful it seemed nothing could take him down. Until one spring, when a series of selfish choices led him to do the unthinkable – to sleep with a woman he was not married to and then, in an attempt to hide his guilt, order the death of her husband. His cover was blown by the prophet Nathan, who confronted the king in his sin, exposing the dirty mess of David’s heart. This psalm stands in stark contrast to almost every other psalm David wrote because instead of proclaiming his own righteousness before his human enemies, David confesses His sinfulness before God, acknowledging the enemy within. In verse seven, he declares that the desire of His heart is to be made clean – to experience the purity of being made “whiter than snow”. Every winter, I find myself wishing there was a way to clear off the roads and keep people safe, but then somehow return the snow back to it’s original pristine perfection. Unfortunately, once it’s contaminated, there’s no going back – no amount of rearranging it, bleaching it, or covering it up would ever work. The only way to restore the purity is for the snow to melt, evaporate, and be regenerated back into new, fresh snow. We know from 2 Samuel 11 that David did make an unsuccessful attempt to “clean” himself by covering up his sin. And when confronted by Nathan, he could have continued the pattern by trying to rearrange the mess and make it look a little less ugly. He could have pointed the finger at his past or his enemies, making excuses because of all he had been through. He could have tried to sugar-coat it with a layer of fancy fluff to make what he did not seem quite so “bad”. But he didn’t. Instead, in Psalm 51, David’s defenses melted. He admitted his transgression was great by acknowledging that “great” compassion was needed. He confessed that his sin was “always before” him and then he owned it by declaring he was “sinful from birth”. David knew that the only way to be made clean was to accept God’s verdict and then allow Him to do the “cleaning” work. One of the greatest temptations we face in our world today is the temptation to try to “clean” ourselves – to clear our name by covering things up or blaming someone or something else. In a world where tolerance is valued over truth, it’s easy to just rearrange the details with some sugary fluff and call it “all good”. But we’re not doing ourselves any favors – it’s not working. 1 John 1:9 says, “If we confess our sins, he is faithful and just and will forgive us our sins and purify us from all unrighteousness.” Like David, the only way we can be made truly clean is to agree with God in His verdict and then allow Him to do the cleansing work. And thankfully, He already did. “He saved us through the washing of rebirth and renewal by the Holy Spirit, whom he poured out on us generously through Jesus Christ our Savior.” (Titus 3:5-6) The “washing” work was done on the cross and now all that is required is for us to accept it. When we do, we become like that fresh, pure coat of snow – the dirty mess of our sin is gone in the eyes of God – and we are made new. For those of you who are looking forward to some southeastern Pennsylvania snow as much as I am, there’s some good news in our extended forecast! I don’t want to get my hopes up, but I can’t wait to look out my window and see that beautiful scene. Even if it’s going to melt into a yucky mess a couple days later – I’ll take it! I feel David’s pain when he described his sin as being “always before” him. I may have my moments of glory – when obedience and trust just seem easy – but the moments of failure always seem soon to follow. And even though I know I’ve been made clean in the eyes of God, my eyes still see a whole lot of dirt and debris. But like the constant cycle of the weather, “renewal by the Holy Spirit” is a process. Not only have I been made new, but I am always being renewed by His Spirit at work in me. The messes I get myself into may cause a meltdown, but every one is an opportunity for Him to remind me that He and only He can make me clean, and that no matter what I see, He sees me as “whiter than snow”.